There’s always something happening at Blennerhasset school! Explore our online calendar or view the archive of school newsletters – just use the links on the right. 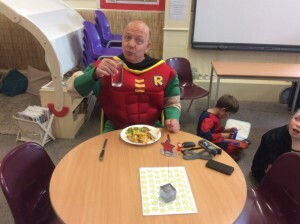 CFM Cash for Kids Superhero Day! 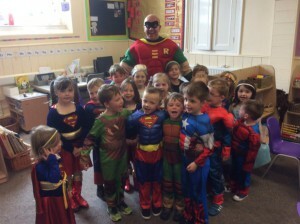 We dressed up as superheroes and helped to raise £100 for CFM Cash for Kids Charity. The children spent the morning finishing the illustrations for our forthcoming book about the recent flooding and then the afternoon over at the cricket field participating in Super Sports! We had a special visitor at lunchtime when Robbie Dee from CFM popped in for lunch with us. The children were very excited to see him again and he was delighted that we were helping such a great cause. Many thanks to all of our staff, children and families who helped to make this such a successful day!